Littleport Football Carries On Regardless! It was just two months into the new football season that Littleport Town FC’s first team were finding it increasingly difficult to field a team each week, with the news that some players were leaving to join other clubs, including their leading goalscorer Jon Bartlett. “Sadly, we really had no alternative but to disband, yet I’m optimistic that we will be back even stronger next season,” their Player Manager Will Rolls told Littleport Life Magazine, who’s main priority now is to help the Reserves do well in their Mead Plant & Grab Division 5B challenge. And so regardless of this lack of a first team , our local club is carrying on regardless, playing the game with the good news that there are some budding young stars making quite an impact, and who currently play under the banner of Littleport Town FC’s Under 7’s. In fact 2 of the youngsters have even been picked to train at Cambridge United. Paula Islam, formerly our local Post Office Manager is delighted that her young son Noah has taken up the sport recently, making his debut as goalkeeper for the Under 7’s just this January. They all have supportive parents who only want the best for their children, and these include The Littleport Players actor and choreographer Nikki Dyer, and her husband Dan Scott, (son of former founder of Littleport Town Colts Under 11 side, Bev Scott) who currently assists Manager Carl Murfet to run the Under 7’s team. Their 7 year old son Freddie has great potential as a striker, and being a Tottenham Hotspur supporter just like his Granddad Bev, he says he models himself on Harry Kane. Young Freddie not only trains with Littleport on Wednesdays, but he goes off to Norwich on a Thursday and plays for PDC Norwich, and then hopes to join Manager Carl’s son Oliver Murfet at Cambridge United, the team both Carl and Oliver follow. Littleport Town FC’s Under 7’s was first started by Manager and Coach Dave Harley two years ago. Carl says he is totally indebted to Dave for all his help that he gave him. “I started helping Dave out before I eventually managed to get a team together. We have entered a league this season and seem to have improved from game to game thanks to the input of Dan Dyer-Scott who helps me out on both training nights and match days. “We train from 5 to 6 pm at the Sports Centre and we have at least 14 players turn up most nights. Those regulars who are committed and train hard are youngsters like Owen, Larry, Nathaniel, Leo, Charlie, Max, Noah, Freddie and Oliver. Of course, at that age they can be a quite a handful at times, but it is so rewarding when you see them improve which really does makes it all worthwhile,” concluded Carl, who along with his brother runs their own cleaning and window cleaning business. According to Nikki there was no club in Littleport which catered for Under 7’s, which was one of the main reasons Carl re-started it. “If it wasn’t for Carl and his wife Amanda, a self-employed nail technician, the club would not have continued. They have given their time, money and effort to support the team for which we are all grateful. 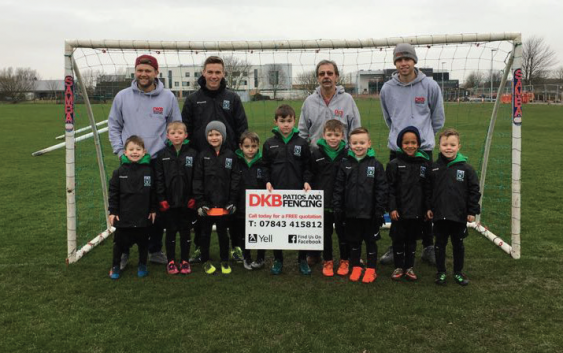 The team are now wearing their new training jackets courtesy of sponsor DKB Patios and Fencing” concluded Nikki.